You just ordered a 5 course meal and you have a movie you need to catch in 15 minutes. No problem. 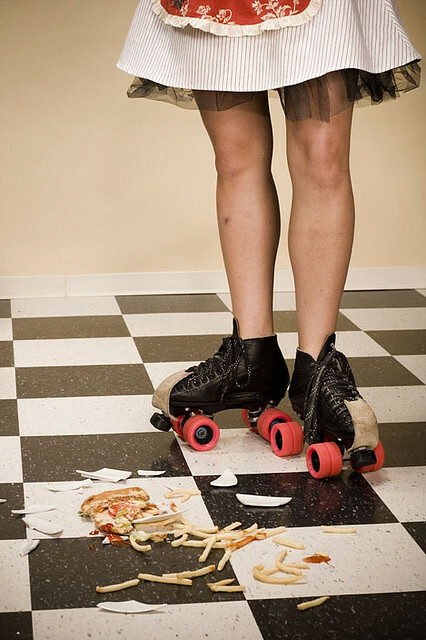 Let me grab my roller skates and I’ll bring it to your car window. Believe it or not, food takes time to prepare and needs to be cooked. If you’re eating at a restaurant, chances are, it’s not going to be a microwave dinner. The foods not gonna cook itself any faster just because you’re in a hurry. Maybe try the drive through next time, or anywhere else that I’m not at. It happens all of the time Prem. LOL. Plastic foods indeed!! And mind you, eating fast is not good for the digestive system. People need to relax and enjoy life. I don’t like when food comes too quick or when a waiter is too eager to clean up my plate. I like to eat slow and enjoy conversation. Youre my kind of people Seakist. Hilarious! I’m glad you found my blog, so now I was able to find yours. Cool. I look forward to reading yours!! LOL. Its funny how some people think this can really happen. I want to go to there house and see how they serve dinner! !